The state of Montana: land renown for its natural beauty and fossils, home to a dedicated breed of people who love the cold and/or downhill sports. Given the 7-9 month periods of cold (depending where you are in the state) and the natural progression of trends from the West Coast, Montana is slowly developing a strong coffee culture of its own. One place that seems to be extending its influence throughout the state is Montana Coffee Traders, a 25 year old operation based out of Northwest Montana near Glacier National Park. 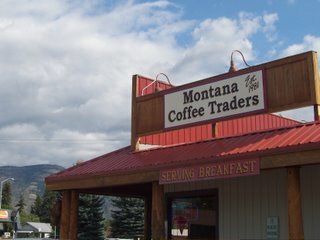 I personally had heard of their beans but did not get a chance to visit a shop until recently running through the town of Columbia Falls. This particular location had a restaurant paired with a coffee bar (I was happy to see that the two aspects were not merged, but that the coffee area was a distinctly separate chunk of the establishment). The interior had a TGI-Fridays-meets-hunting-lodge look (when in Rome?) with seemingly adequate seating (definitely not enough for the Sunday rush). The coffee, to my chagrin, was fairly tasty. The medium blend hit the spot, though the dark blend was a little overdone (couldn't put my finger to whether it was brewed strong or if it had something else to it). 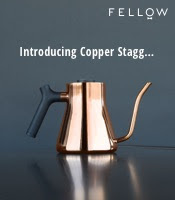 They offer numerous blends and seem to be very dedicated to well-roasted, socially-responsible (i.e. fair-trade) java. The espresso was completely different; it tasted so burnt I nearly spat it on the floor. The beans seemed stale as well as a little too over-roasted. That paired with questionable barista skill(s) (maybe it was an off day?) definitely exposed a possible weak spot in a seemingly strong tank. The teas came from Montana Tea and Spice, a company out of Missoula that's been around since disco. This tea I've seen in various Montana coffee locations though I have yet to sample it. It looks promising (I hope). 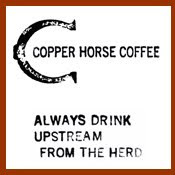 Regarding the various coffeehouse aspects, I'd have to say it was good, especially for a small town like Columbia Falls. If you're going to Glacier or you're of the few hardy folk who live in NW Montana, I'd say it's a good java option. Myself I am not a coffee man. I am a soda man. They are both have caffeine in them so maybe that counts for something? Know anything about coffee in the Philly area?